Contra Connections: Two videos on one disk! Paid to Eat Ice Cream tells the story of New England through the career of Bob McQuillen, the legendary piano player and tunesmith. What's Not to Like? is a portrait of David's home dance with Northern Spy in Norwich, Vermont, a monthly series that has been running since November of 1980. 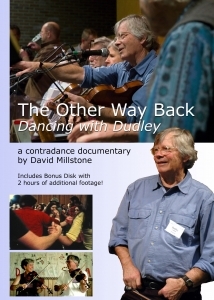 The Other Way Back: Dudley Laufman is one of the most important figures in 20th century contra dance history, a recipient of the National Heritage Fellowship. 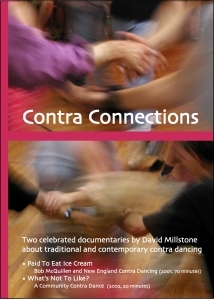 This video documents the vital role he played in creating the contra dance revival we are part of today. Sweet Talk: Connecticut dance caller Ralph Sweet has been at the caller's mic for more than 60 years, including 20 as part of the Modern Western Square Dance movement. 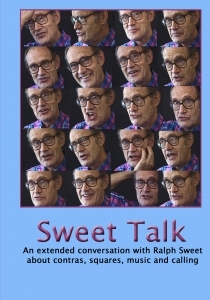 This interview is expanded with photographs and audio clips of the many other figures who influenced his work. Square Dance with Lester Bradley: Lester represented New Hampshire at the 1999 Smithsonian Folklife Festival in Washington, DC. 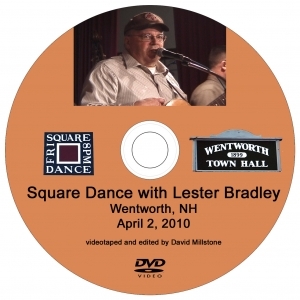 His monthly dance in Wentworth, NH, features traditional squares. Lester calls and plays guitar, and is joined by an open stage of a dozen musicians. 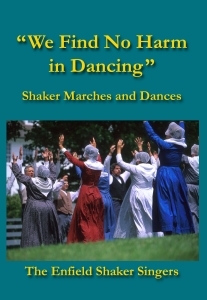 We Find No Harm in Dancing: The Enfield, NH,Shaker Singer commissioned this project, a detailed documentation of several decades of research into Shaker dances. 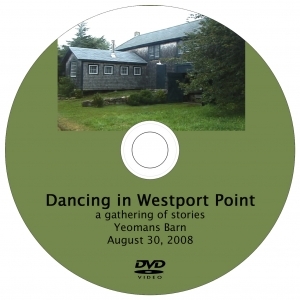 Filmed on location at the Shaker Museum, the video contains edited versions of dances with commentary, plus unabridged versions of each dance. We all enjoy looking at old movies and videos that show people dancing in bygone days. If we do a good job of documenting our current scene, we'll have the pleasure in the future of looking back at us as we once were, and we'll leave a record for the future. Here's an overview of what is involved. Who should document a dance? You wouldn’t be reading this unless you were already an eager dancer or musician.You’re known by people at your local dances, and respected by them for your leadership,whether formal or informal. You set an example. You’re less likely to meet resistance—“What’s that camera doing here?”—than a less-familiar person might encounter. As a dance leader, you’re aware of the ins and outs of your local dance scene. You are more familiar with the history of the local dance series and the ritual dance groups. You know the old-timers, the folks who were instrumental in building the dance community. (In some cases, that just means looking in the mirror.) You know the local characters who can tell a story with verve and ﬂair. Most of all, you know what’s special about your dance community and what story needs telling. That said, there are many others who can assist with your project. Start by investigating your local community access television station; they will offer training and will let people use their equipment, both for shooting and editing. You may also ﬁnd volunteers there who will be happy to assist on a project. Look at ﬁlm departments at local universities, too. Students in such programs may enjoy the opportunity to help produce a documentary. Camcorder: Any footage you get is better than no footage. Don’t let the absence of the ultimate equipment keep you from getting started. Use a digital camcorder; digital video can be easily imported into computers for editing. Models that record to mini DV tape produce high quality images that are often better than those that record to a small DVD disk or ﬂash memory. High deﬁnition (HD) video is the current rage, but standard digital video will do just ﬁne and will save you a lot of money. You need a tripod. Some models are better than others—a ﬂuid head allows you to make smooth movements of the camera—but any tripod will let you take steady shots.There are times when you hand hold the camera but for most shots, use a tripod. 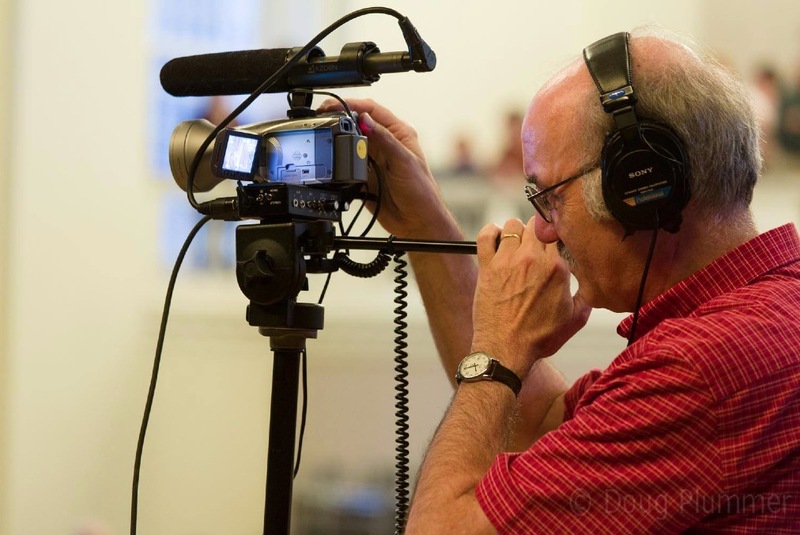 External microphone: Any digital camcorder, whether a $300 or a $2,000 model, will give you far better pictures than sound; to get good audio, you need to purchase additional equipment. If you’re interviewing someone, use a tiny lavalier microphone that clips on to the subject’s clothing, or a shotgun microphone that screens out distracting sounds from the sides. Your camcorder has to accept an external microphone for this to work. Additional audio gizmos: Consider a small mixer that will let you record audio from two sources. (I use an XLR Pro from SignVideo; Beachtek is another brand.) One source could be a signal coming directly from the band’s mixing board, or even plugged into a speaker. (The hall speaker will have the caller in the mix; the band’s monitor speakers usually do not have the caller.) Another audio source might be an external shotgun mic. Headphones: Use a good pair of headphones to monitor the quality of your recorded sound. Make sure your camcorder has an input for headphones; some cheap camcorders omit this feature to cut costs. Without headphones, you cannot be sure what you’re getting. Audio is very important! Your audience can tolerate a poor picture if there’s good sound. Lights: Camcorders work best in bright light. Do a test in your hall, and add more if needed. Halogen shop lights produce 500 watts (bounce the light off the ceiling rather than directly at your dancers), enough to make a marked difference in a small hall. Caution—these lights are HOT and need to be placed carefully to avoid a ﬁre. What kinds of shots are useful? Let’s say that you want a record of your regular monthly dance, a sort of video snap­shot. Post a large sign at the entrance to the hall so folks will know why you’re shooting,and word it so that by entering they are giving permission to be ﬁlmed. Keep the camera rolling as much as possible to provide audio continuity. If you want to provide a simple recording of the event, you can avoid lots of work. Set your tripod in a good location, press "record" and let the camera roll. Even that simple footage record will be of use for future dancers and historians. Staying by your camera to pan slowly from side to side or to zoom in on occasion will provide a more interesting picture. If you're ﬁlming squares, include all the dancers in a square, head to foot. If you're planning to edit, then include many different kinds of shots of the dancers:scenes of the whole hall from different angles (from the stage, from a balcony or ladder on the side, from the dancers’ eye level), closeups (faces, hands, feet, swings, stars and allemande grips, smiles, different styles of balance steps). Follow one good dancer through a complete sequence of moves in a dance. Pan (side to side) very slowly. Avoid zooming in and out; don’t jump quickly from one shot to another. Caller: Include complete teaching sequence for a few dances, as well as the calls given during a particular dance. We know what callers sound like, but this is for posterity.Wouldn’t it be fun to see a dance caller from the late 1800s? Where do I send my finished footage so it's available to others? Share it with others and donate footage to an archive. For contras, I’d suggest the Library of Traditional Music and Dance, Special Collections at the University of New Hampshire in Durham.